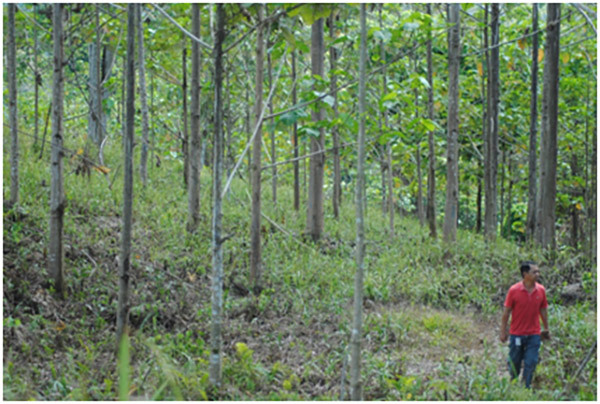 Forest rehabilitation is deemed necessary to assist the recovery of a forest ecosystem in some 3,000 hectares of area that has been heavily degraded in FMU 19B, SLFR. According to Sabah Land Use Capability Study 1967, SLFR which is located within the Lokan Peneplain is a highly productive forest with good soil type mainly of Tanjung Lipat Family derived from inter-bedded of sand stone and mudstone. Accordingly, based on SLFR land condition, tree species used for forest rehabilitation are mainly focus on the native species, which is dipterocarps and some pioneer species like Laran and Binuang. Harvesting historical data from 1995-2010 shows production significantly lower than initial capacity of 180 mᵌ/ha with an average production of 15 mᵌ/ha over that period. Similarly, strata analysis through image interpretation in mid 1990s support that notion showing 80% of the area is categorized in Strata 4 with an average 5 trees per ha at dbh more than 60cm. Based on these assessments, a comprehensive forest rehabilitation management strategy have been set up to shift the forest stocking from poor to good. Therefore, to ensure the rehabilitation activities to fulfil its obligation for a sound environmentally managed forest, a hybrid approach of forest rehabilitation namely High Production Corridor (HPC) was introduced in KTSP. HPC is basically an establishment of a well-managed corridor to fill in the gap created during harvesting along feeder road and skid trail through comprehensive silvicultural regime. Such method would ensure high growth rate of both planted and natural regeneration (Potential Crop Trees) in rehabilitation area. Upon harvesting cycle maturity, this corridor will supply most of the harvesting volume requirement as indicated in the AAC and thereafter will reduce pressure on adjacent natural forest stand for timber. Forest rehabilitation in FMU 19(B) is supported by one central nursery producing a total of approximately 10,000 seedlings per month with nursery capacity of over 200,000 seedlings per year. Seedlings are produced from wildings and seeds. Seeds are supplied by collection in SLFR itself and supplemented by Sabah Forestry Department. Annual seed production is depends on planting requirement. The nursery team are looking forward to specialize seedling production from Red Seraya Group, Sweetenia macrophylla, Neolamarckia cadamba and Nauclea subdita. This specialization will allow to concentrate on producing high quality seedling resulted in high survival rate in the field. After been logged for many times, the biodiversity composition of SLFR has gone through changes which may include loses of unrecorded genetic resources in terms of forest flora. An inclusive Method of forest rehabilitation is therefore required to ensure that the possible losses of endangered, rare and threatened species of the forest flora and fauna including special biological features could be prevented. While applying HPC method in forest rehabilitation, it could help in protecting the uniqueness of SLFR forest biodiversity where mechanical land clearing is never allowed during the establishment, selection of tree species for planting material is correspondingly based on the site suitability, and mainly focus on the high commercial timber species. Three years old Binuang planted in Compartment 65, Block 1, 225 Hectares.